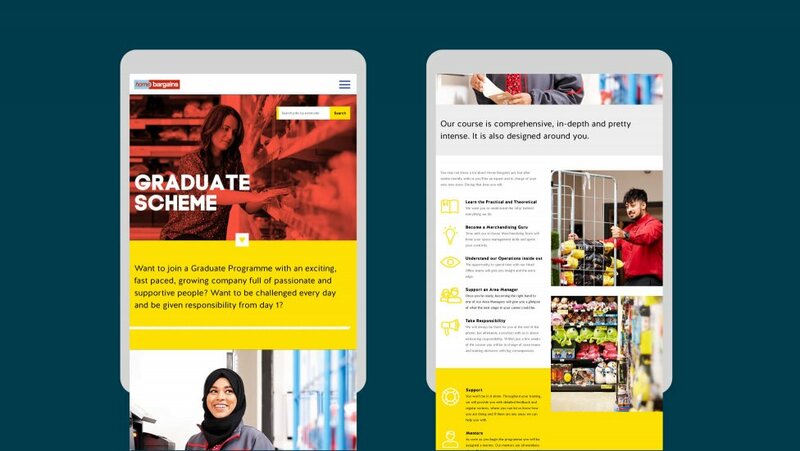 To support Home Bargains’ quality recruitment drive, we designed and developed a bright, engaging and easy to use careers website. Home Bargains has been steadily growing over the last few years, with ambitious plans to grow to 800 stores and over 30,000 staff. The company owes its success to a solid combination of a positive working environment, a customer-centric philosophy that offers discount prices in fresh, modern and well designed stores, and friendly yet professional customer service. 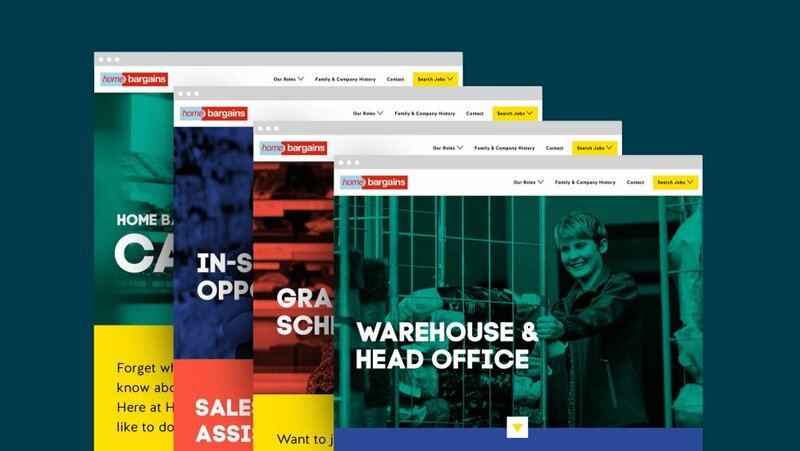 The company also attributes much of their achievements to the commitment and calibre of the employees they attract, so to continue to support company growth by attracting the best candidates, Home Bargains asked us to refresh their Careers website. In order to encourage potential candidates to apply, the new website needed to offer a straightforward and engaging job search experience that focused on the user’s geographic location. 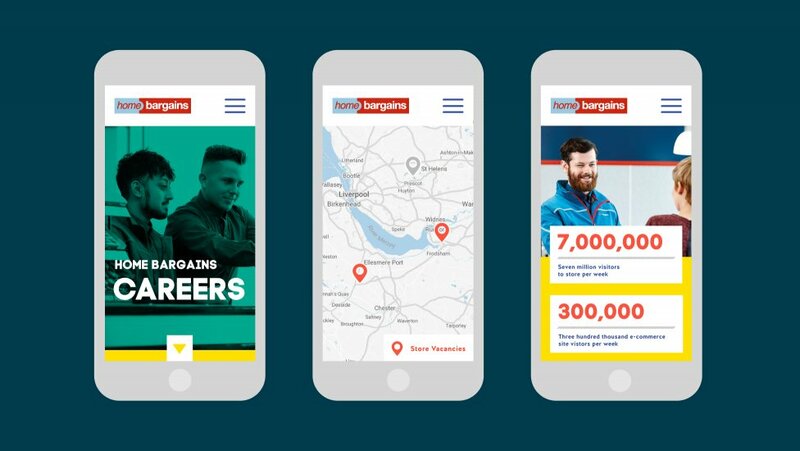 After carrying out AB testing to identify the best option from a UX perspective, we designed a careers website that presents Home Bargains as a successful, vibrant, forward-looking inclusive organisation which rewards top talent with a great working environment and a wide range of exciting career opportunities. The website succeeds at helping Home Bargains change audience perceptions by encouraging them to rethink what they know about discount retail. 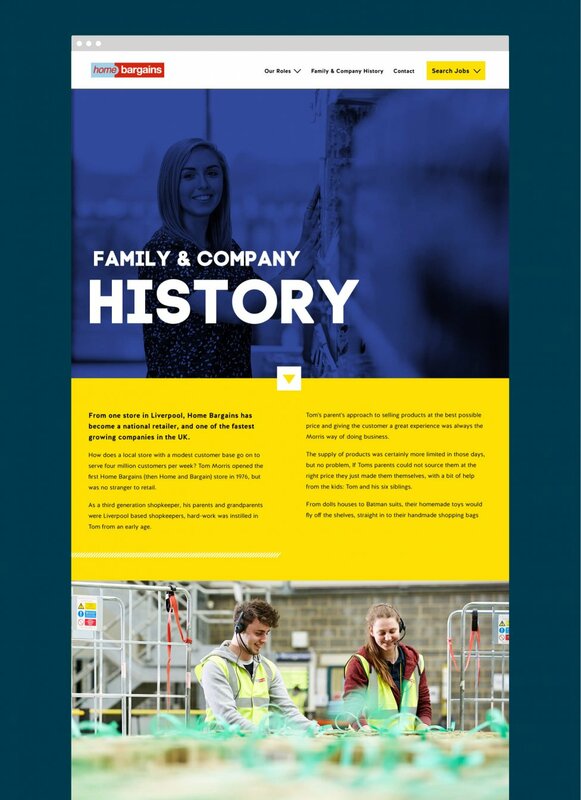 The careers website design contributes to candidate appeal by presenting Home Bargains’ pride in its origins – a family-run and family-owned business – through the use of punchy contemporary colour tones and engaging copy that speaks directly to the audience in a warm yet confident manner. Scroll functionality and smooth transitions add a subtle dose of interactivity, while a playful counter device helps company achievements stick in the mind. A user-friendly ‘mobile first’ searchable interface contributes to a rewarding online experience, by making vacancy searches a quick and easy process. Applicants can search by location and role category, and we also built in functionality to allow users to search by keyword. 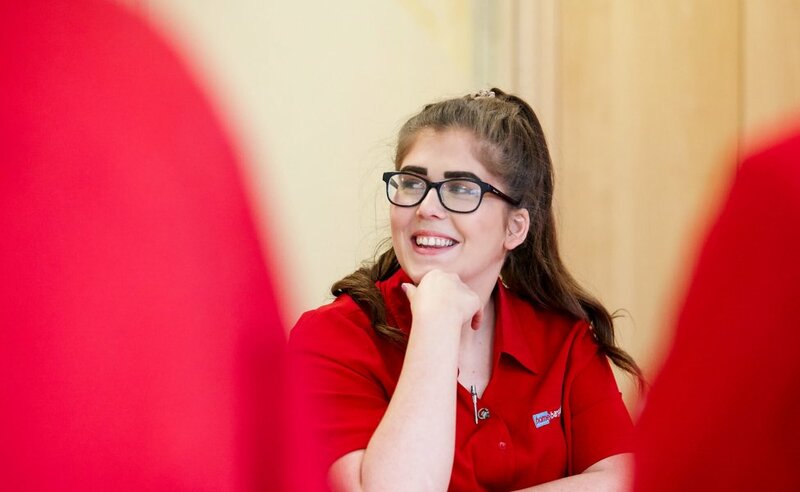 The search results pages are clearly laid out and contribute to a smooth job application journey – ultimately helping Home Bargains identify the best candidates and fill posts quickly. In order to achieve the desired user experience, we developed an entirely new search interface that periodically polls raw job vacancy data from a third party API (Application Programming Interface). The interface then indexes results based on role and geographic location, and sets suitable cache retention policies to ensure data accuracy and recency. At the point of search, the application then overlays the matched results on a regional map via the Google Maps API, giving a real sense of locality to the listings. 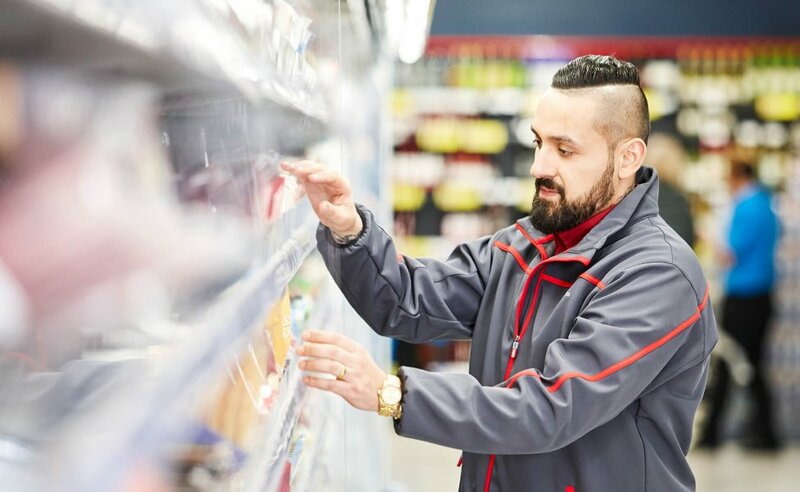 We were involved in the coordination of a professional photo shoot that features Home Bargains employees at work in a variety of roles, transmitting a sense of the diverse make-up of the company. Vibrant and dynamic illustrations inject positivity and energy. A bright and confident brochure design that supports company growth by attracting top graduate talent.